[10:02:20] warpme: paulh: I’m wonder what areas of XBMC You think are much better than in MythTV? [10:06:32] SteveGoodey: Am I right in thinking you still need e.g. Mythtv to get tv shows into XBMC? [10:15:19] dekarl: peper03: aye, that's how it is currently implemented. But I'd like to start fix stuff. E.g. all the implicit assumptions the the guide is coming from Data Direct all over the code... Now that we get program and series ids from different DVB channels everything works a bit differently. [10:19:10] dekarl: e.g. we have two programs with different program ids, but we know they are from different id domains, so we can't use them for comparison. [10:38:30] warpme: dekarl: if I would consider where so valuable dev resources should be alocated – I think defining target MythTV use cases and make them features-complete/stable is worth to consider. I’m trying to say assgning resources to areas where competition is beter is worse strategy than improve areas of competitive advanatge. [11:08:59] warpme: dekarl: that would be perfect. I would say possibility to start HLS from arbitrary is even more desirable. You know when user during many Years is not forced to watch any commercials at all (because of DVR capab. ), situation when he must watch them using HLS is real PAIN! [11:18:48] dekarl: stuartm, I see lots of talk about the form factor of the boards, but whats the on-air protocol? DECT-ULE? [11:20:07] warpme: stuartm: I know sometime period of rest can give fresh view and new energy. So nice You have plans to improve MythTV! [11:48:04] jya_: i do think that xbmc looks much nicer up front than mythfrontend. it does more things, the search for metadata is heaps better and faster, it works on many platforms..
[12:16:49] warpme: Also services API might be key. Growing community od 3rp party devs arround services API is one from best things which happens for myth. By this we can consider to offer diferent paradigm compared to XBMC/PLEX: openess as catalyst to grow ecosystem. [12:38:36] dekarl: basically I'd love to get VoD services integrated into Atlas and the put Mythnetvision on top of that. [12:43:28] dekarl: jya_: I can't even remember the last time that someone contributed a addon for one of the interfaces that we do already have. e.g. weather grabber, movie grabber, etc. [12:44:53] jya_: there’s no central database of any kind. [18:32:48] gigem: dekarl: Program titles must match before any other duplicate checking is done. We tried very briefly using just programid a while back, but it made scheduling way too slow. Specifically, it was the checking of the oldrecorded table for previous recordings. [18:35:58] gigem: jya: XBMC does indeed look nice and has much nicer eye candy than MythTV. I've never tried to use it for any extended period of time, though, since recorded TV is by far my primary use case and the DVR interface in XBMC is way behind mythfronend in that functionality. [18:37:58] gigem: stuartm: I'm also in favor of ripping out old stuff like Xv, Qt painting, analog/framegrabber recorders and other little used stuff. I only ask that if it something I actually used, it be ripped out in such a way that I can try to maintain it locally for myself. [18:39:00] dekarl: gigem, strange. I wonder if I can fix ProgramInfo etc, but leave the scheduler SQL alone. [18:51:11] gigem: interesting if that program is on at another time too? Again what are you trying to accomplish? If it's to catch cases where programs can be on any of a family of networks (eg. ESPN/ESPN2/ESPNU, BBC1/BBC2, etc. ), I think extending the scheduler to handle network groups would be a better approach. [18:53:33] gigem: stuartm: My reason for suggesting to consider pet developer features for removal is to continue simplifying things. Don't get me wrong, I love the power of MythTV, but even I've come to accept that it is way more complicated for many people. [18:55:41] gigem: stuartm: SD/HD *should* use the same callsign. That's specifically what the feature is for. Regional variations could be handled with the netwrok family thing I mentioned. [18:56:09] stuartm: fwiw, the changes don't say "This showing will be recorded", it says "This showing will be recorded on another channel"
[18:58:12] gigem: I know, but you're still blurring the fact that showing on that channel is *not* scheduled. Again, why is the case, and only the case, where it will be recorded on another channel so important. Is it really more important than the cases where it won't be recorded at that time, but will at another? [19:01:11] gigem: It will be a very rare case for me, which is why I haven't raised a big stink. I'm more concerned about the support aspect. It's hard enough getting sufficient details to diagnose problems from some users and this could make it much harder. [19:02:12] gigem: Right, but isn't just as important to let the user know it *is* scheduled and will or will not be recorded at some other time? That's why we have the early/later showing and conflict statuses. [19:09:04] gigem: other showings marked as earlier/later as well? [19:11:15] gigem: Callsign is just the term we use over here. I'm sure everyone else also has shorts by which they refer to their channels. [19:13:03] stuartm: if 10 different channels show the exact same program at the exact same time, one will be marked "Will record" the other nine will be marked "Other channel/showing", those at different times are still marked as "Earlier/later"
[19:13:04] gigem: Then I don't think I understand your change. Or it actually changes more programs than you think it does. I'll run a test later to confirm it either way. [19:14:33] gigem: I could be wrong, and I will check, but the last time I looked at the changes, I believed it would also mark programs that weren't scheduled at all as other showing too. That's my concern. If that's not the case, then I don't have a problem. [19:17:10] gigem: Okay. I'll run a few tests later and will let you know the results. I hope I'm wrong and this is all much to do about nothing. 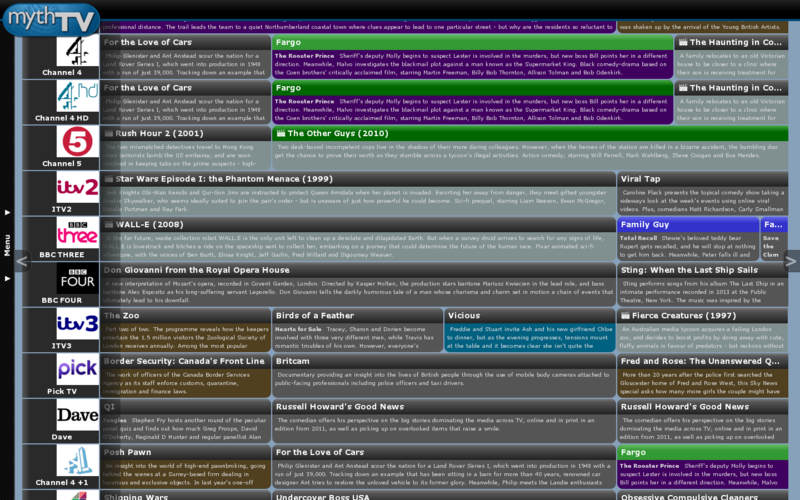 [19:49:47] stuartm: the dark green one is the one which will be recorded, the light green indicates otherShowing/earlierShowing, now unfortunately I couldn't get the hover popup to remain on screen while I took the screenshot but the later episode is correctly showing "Earlier showing" while the concurrent showing shows "Other showing"
[21:10:18] gigem: showings on the other channel (the one you didn't originally schedule on and, technically, aren't scheduled) only the ones that occur at the same time as the real recordings get marked as other showing. All of the others don't get marked with anything. That is what I don't like. I'll try to come up with a better way to mark programs as other showing, but doesn't mark unscheduled programs in the process. [21:43:03] skd5aner: I'm getting ready to move, and unfortuantely, it looks liek I'm going to be switching to satellite. Which means I'm going to have to use HD-PVRs exclusively connected to my STBs to record.